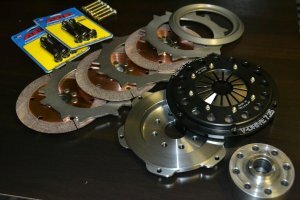 This is it: the holy grail of clutches for the 1UZ swap. 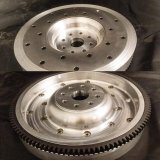 This clutch is a 7.25" twin or rally twin disc button clutch that can hold over 800HP and weighs less than an OEM type clutch INCLUDING the flywheel and spacer plate!! This clutch is 100% made for the UZ swap, no modified flywheel or clutch setup. When we decided to build the ultimate clutch for our V8 swap, we looked to the industry leader and manufacturing giant that is QuarterMaster. They have been supplying NASCAR for years, so there is no better place to get the best product from. If you need the OEM starter gear and shim, you can select that from our drop down menu as well. For the complete setup please select the QMI throw-out bearing kit as well. 1uz-fe 1uz 2uz 3uz conversion twin triple QUARTERMASTER clutch One bad clutch for one bad swap!